Errech is thanksgiving; worshiping and praying to the one God called ‘Waaqa’ or the universal creator through colorful cultural practice. 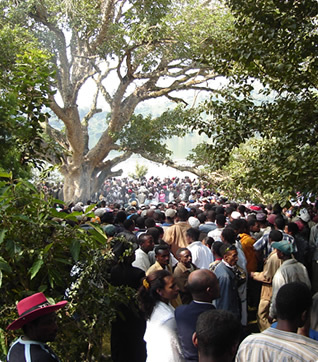 Errecha ritual ceremony contains in itself religious, cultural and philosophical world view which admires the miraculous spiritual powers of the waaqa and co –jointly relates the living secrete of generation and is a replica of the Oromo peoples cultural, social, economical and political status. It is a belief in a monotheistic power that is Waaqa. Its ritual ceremony is conducted at different places though by and large it usually takes place at two major areas and seasons. Errecha Tullu: – which is performed at the top of the mountains during the dry season. It is performed at the beginning of the spring season when both men and cattle suffer from drought. So, it is the time when the Oromo living in the vicinity are gathered together to pry to their waaqa to give the rain. Errech Malka: – that is performed at the river bank in September and is this day’s famous one. The Oromo who live on the highlands areas, start taking their cattle to Hora at this geographical and climatically juncture. So it is the first and a new start in their work and routine lives.